A sweet sounding saxaphone and the Dexter Gordon Biography shows us how sweet he was! Born Dexter Keith Gordon, February 27, 1923, in Los Angeles, CA; died of cancer and kidney failure, April 25, 1990, in Philadelphia, PA; son of a physician; second wife named Fenja; married third wife, Maxine (a jazz promoter), 1982; children: (first marriage) Dee Dee, Robin; (second marriage) Benjamin; (third marriage) Woody (stepson). Dexter Gordon Biography starts with Dexter--or "Long Tall Dex," as the six-foot, five-inch jazz saxophonist was often called--was one of the primary innovators of bebop jazz and a perennial favorite of audiences and music critics. Th c cat had a natural sense of "cool" that made him the picture of the classic "jazz cat! His father an avid fan of the music, he was exposed to jazz from the time he was an infant. When Gordon was about seven years old, his family attended a concert by pianist Duke Ellington's orchestra. Years later he described it to Rolling Stone writer Neil Tesser: "The house lights came down, and everything was dark, and all of a sudden there was this pale-blue light shining on some kind of blue-turquoise translucent screen, and behind the screen was the Duke Ellington band ... beautiful. They were playing the theme song, 'East St. Louis Toodle-oo.' And boy, it was magic. I never got over that." The lil' jazz cat could dig the music way back then! WoW! After studying Young's style and sound, Gordon fell in love with the robust voice of the tenor sax and adopted the instrument as his own when he was 17--the same year he hit the road as a member of vibraphonist Lionel Hampton's band. He stayed with Hampton for roughly two years before jumping to pianist Fletcher Henderson's outfit very briefly and then moving on to trumpeter Louis Armstrong's ensemble. While he admired Armstrong's sound, he chafed at the band's conservative approach to music. "Everything was just blah," he told Ira Gitler, author of Jazz Masters of the Forties. "You played a job, and that was the whole thing." Within six months he had become a member of singer Billy Eckstine's group. There he was more comfortable, playing alongside other legends-to-be like Parker and trumpeter Dizzy Gillespie. The difference was "like night and day," Gordon told Gitler, "because there was nothing but happenings, excitement, and enthusiasm in Eckstine's band." The dude wanted to be with younger cats who he could "vibe" with...It was natural for the cat to want to be with his age group... all respect to Louis Armstrong, but he was "old" in Dexters' eyes! On their journey toward what would become known as bebop, Eckstine's sidemen broke musical ground daily in their casual jam sessions. By 1945, many of them felt they had outgrown the confines of the big-band sound and had gravitated to New York City's Harlem, where a new style of jazz was taking shape. Gordon was among them. The fast pace, adventurous chords, complex harmonies, and extended improvisations the young players were producing constituted a true musical revolution--one that met with considerable resistance, even hostility, from their elders. Gordon and his peers had no idea how drastically they were changing the course of jazz, "but," he told Rolling Stone' s Tesser, "we knew we were doing something different--something hip, something fly, something wild." 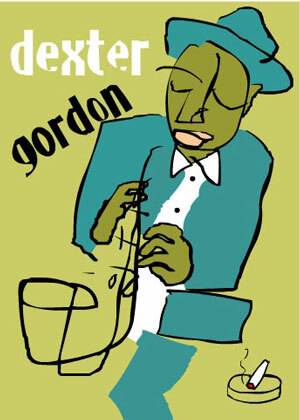 Throughout the late 1940s and early '50s, Gordon toured and recorded with most of the notable musicians of the day and cut classic records such as Dexter's Deck, Dexter Rides Again, and Long Tall Dexter. His sound was distinguished by "tonal authority at any tempo--from romantic ballad to soulful swagger to ferocious romp--and melodic lines all sinew and muscle," according to Down Beat' s Art Lange. "His gruff tone and aristocratic demeanor came from Coleman Hawkins, his rhythmic insouciance from Lester Young, his harmonic license from Charlie Parker. But the blend came out original Dexter, with a wry, dry wit manifested in a penchant for incorporating the most incongruous of quotes into the fabric of his solos." But musical revolution wasn't the only thing happening in Harlem; heroin was a major element of the bop subculture and Gordon, like many of his friends, became addicted. In the mid-1950s he landed in Chino, an experimental minimum-security prison in Los Angeles. It was there that he had his first brush with acting, which would become a second career, when he appeared in the film Unchained, an examination of the minimum-security system. Gordon's incarceration lasted only a few months, and soon after his release he was back on heroin. Ultimately, a decade of addiction began to interfere with his music. "I had to shoot up before I played, and it got in the way of my jobs," he told People magazine contributor David Hutchings. "I didn't get fired but I didn't get hired either. People didn't know when or if I'd show up." In 1960, with his musical career at a low point, Gordon became involved with Jack Gelber's play The Connection, which explored heroin addiction. He had a substantial speaking part, and he also wrote and performed the score. That experience restored much of his eroded confidence and led to his first record in many years, The Resurgence of Dexter Gordon, which in turn resulted in a contract with Blue Note Records. Blue Note was in New York, so Gordon returned to the East Coast in 1960. Finally free of his heroin addiction, the shadows of his past nonetheless haunted him; the New York City police department refused to issue him a cabaret card, necessary to perform in nightclubs. Without it, little work was available. Gordon also found the mood in New York greatly changed and little to his liking. "Cats here are bored," he told Jazz Masters author Gitler at the time. "Everyone is on an introverted, oddball type thing.... There's no enthusiasm, no fire." When Gordon was offered a few weeks' work in Europe in 1962, he gladly left the country. The weeks stretched into 14 years. In Europe, "there was no racial discrimination or anything like that," Gordon told Downbeat' s Berg. "And the fact that you're an artist in Europe means something. They treat you with a lot of respect. In America, you know, they say, 'Do you make any money?' If you're in the dollars, you're okay, you're alright. But over there, it's an entirely different mentality." Gordon may well have remained abroad indefinitely if not for the efforts of a jazz promoter who would eventually become his third wife. In 1976 she persuaded him to tour the United States. It was "one of the events of 1976," wrote Berg. "[Standing-room-only] crowds greeted him with thunderous applause.... Music biz insiders packed an RCA studio control room to savor each passage as Dex and a cast of all-stars set down tracks.... Long lines of fans snaked up the stairs of Max Gordon's Village Vanguard waiting their chance to share Dexter's musical magic. Their reaction to the master saxophonist's New York stop-over was nothing short of phenomenal." The response convinced Gordon that the time had come to return to his native country. The saxophonist's triumphant reign of the jazz circuit continued throughout the late 1970s and early '80s, but in 1983, he made what he expected to be his final appearance. Though he was just 60 years old, fast living had exacted a heavy toll on his health. For three years Gordon lived quietly with his wife and stepson, but his career was not yet over. In 1986, French filmmaker Bertrand Tavernier asked the musician to star in 'Round Midnight, a film he was making about a down-and-out jazz musician living in Paris. The fictional story was based on the lives of jazz luminaries Lester Young, Bud Powell, and Gordon himself. Tavernier told Berg that when he first met Gordon, he "had the impression he was going to fall down and die on the spot," but despite his fragile health, Gordon turned in a masterful portrayal of his character, Dale Turner; he was even nominated for an Academy Award. In 1987 he and the other musicians from the cast of 'Round Midnight did a short tour, performing the music they'd created for the film. It was a fitting finale to a long, arduous road of far-flung concert and club dates. Gordon performed occasionally after 1987 and played a small part in the film Awakenings, but he did not live to see the release of that film; a combination of cancer and kidney failure took his life in April of 1990. Back to Dexter Gordon Biography and other Jazz Cats!